'Birdman of Alcatraz', the moniker given to prisoner turned world renowned ornithologist Robert Stroud (played here by Burt Lancaster), is something of a misnomer. When Stroud was transferred to the island prison known as 'The Rock' in 1942, he was unable to take his beloved birds with him, a cruel punishment which John Frankenheimer's film suggests was enacted by vengeful warden Harvey Shoemaker (Karl Malden). Stroud makes an enemy of Shoemaker early on when as a young man, he is sent to Kansas's Leavenworth Prison to serve time for murder. The movie is vague about the details of Stroud's crime, omitting the fact that the real life Stroud was a pimp who killed one of his prostitute's clients, but he isn't portrayed as a nice guy - far from it, as we soon see him murder a prison guard in a debatable piece of self defence. Thanks to the tireless work of his mother (Thelma Ritter), Stroud dodges the death penalty but is sentenced to life imprisonment in solitary, much to the chagrin of Shoemaker. Left alone with his troubled thoughts, Stroud's daily routine is a grim one, pacing back and forth in the yard for an hour becoming the highlight of his day. It's during one of these reprieves that he stumbles across a young wounded sparrow, which he takes into his cell and nurses back to health. Thus begins the remarkable journey Stroud takes from a bitter inmate with nothing to live for to an expert in the care of birds, one who would amass a following among bird lovers and scientists across the world. 'What is a man without purpose?' asks Frankenheimer's film. With decades of hollow emptiness to fill, Stroud is rescued by the small creature he himself saved from death. At first the sparrow is a mere companion, but it gives Stroud a purpose, and with it hope, that emotional state that keeps our heads above water in times when it feels like life wants to push us under. It makes Stroud a better man, as he develops a warm relationship with Bull (Neville Brand), a prison guard who develops a fascination with Stroud and his growing collection of birds. It's one of those great old friendships built on an unexpressed platonic affection and mutual respect, and when late on, Bull is forced to break the news to Stroud that he is being transferred to Alcatraz, the tears that clot in the corners of his eyes may have audience members reaching for tissues of their own. Birdman of Alcatraz runs for a lengthy 143 minutes, and on paper not a lot happens, but Frankenheimer uses his film's length to reflect the tedium of prison life. That's not to say the movie is tedious, but we certainly feel time pass as Stroud fills his confined existence with little moments of joy. The life Stroud builds in such uninhabitable surroundings is almost enviable in its simplicity, and without raising another hand to any prison guards, he strikes a blow to the prison system with his quiet defiance. Building a life for himself and filling his days with purpose is an attack on a system that favours punishment over rehabilitation. Lancaster is excellent in the role, his hulking frame initially haunched but gradually straightening as he acquires the will to live. He doesn't sugarcoat Stroud, who remains impolite and ungrateful in the face of the favours done by Bull and bird lover Stella Johnson (Betty Field), who even marries the convict to help him progress with his invaluable work in the field of avian medicine, and we get the sense that Stroud has never seen kindness or human charity before, and simply doesn't know how to acknowledge it. By the end of the movie he's wrinkled and gray, but he stands proud in the face of Shoemaker's attempt to finally break him by separating him from his beloved birds. At the time the film was made, in 1962, Stroud was still a prisoner, and would remain so until his death the following year. 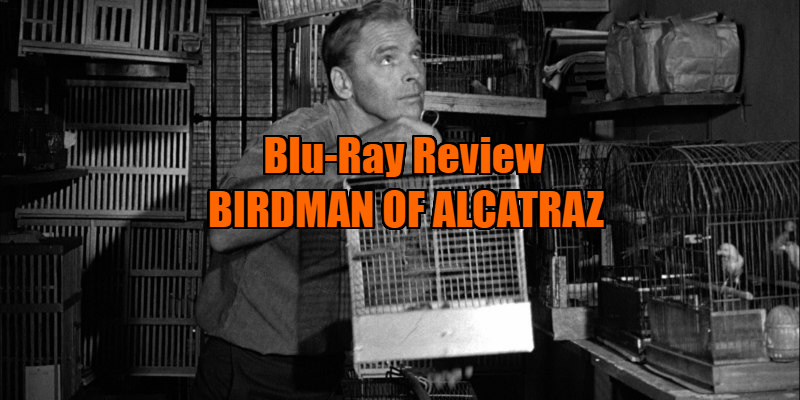 Is Birdman of Alcatraz an accurate depiction of the convict? Those in the know say not, with his fellow prisoners and guards describing Stroud as a sinister and cruel psychopath. But sometimes it's more important to print the legend, and Frankenheimer's film would likely be far less inspirational if it painted a more grimly realistic portrait of its troubled subject. Feature commentary with film historian and editor Paul Seydor, moderated by Twilight Time's Julie Kirgo and Nick Redman; extended interviews with cameraman Richard H. Kline and film historian Sheldon Hall; original trailer; collector’s booklet featuring new writing on the film by Travis Crawford, as well as a selection of archival imagery from the film’s production. 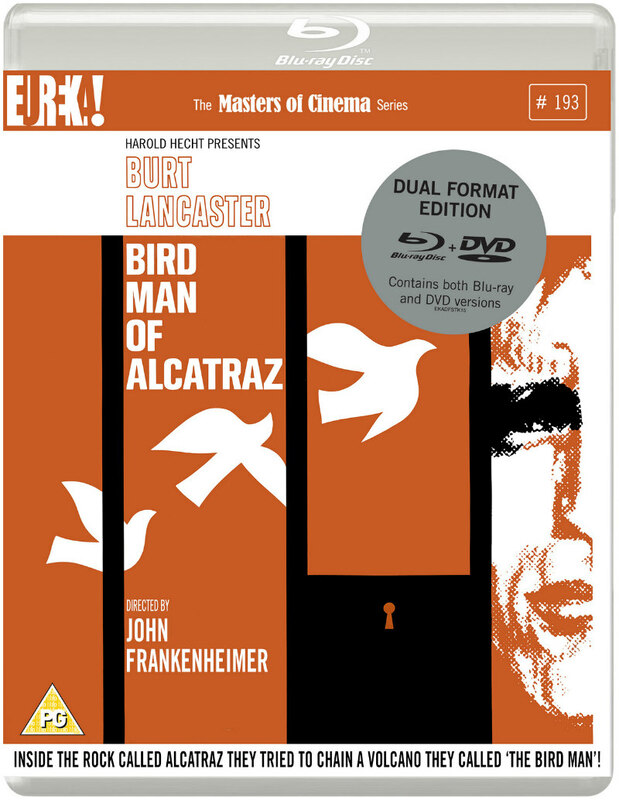 Birdman of Alcatraz is on dual format blu-ray/DVD August 6th from Eureka Masters of Cinema.